Book reviews are so important before a book is released. 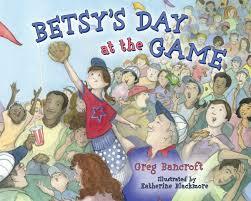 And Greg Bancroft, an author, a father and a grandfather, asked me if I would review Betsy's Day at the Game. I was honored and excited, especially because I love baseball! Before I start the review, I'd like to share how important it is for an author to have readers comment on Amazon, Barnes & Noble and other ebookstores. It helps the author build their reputation, increase their sales and gain creditability. What a reader has to be aware of is that their review can truly impact an author's success. Honesty is key. But also making sure that your review is about the author's writing and not the publisher's formatting or your ereaders technical limitations. Technology still has a lot of limitations, and to place blame on the author whose primary skill is writing, when it is a technical issue with the readers ereader is truly insensitive. So, when you write a review for an author on an ebookstore, please write the review about the story. And think about how your words will affect an artists career and how you would feel if someone wrote those words about something you poured a lot of heart and soul into. Now to sharing my review of Betsy's Day at the Game! 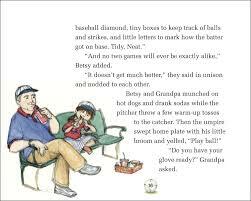 "..a sweet story about family tradition and the art of keeping score." "...celebrates the ways baseball is passed down through generations." Betsy loves hanging out with her grandfather, especially at the baseball park. Today is another game day, and Betsy is ready to show her grandpa all she's learned about keeping score. Betsy keeps track of it all - foul balls, home runs, and favorite players - but more exciting things are about to happen than just what's on her scoresheet. "Elisabeth, Grandpa's here," Betsy's mom called out. A car pulled in to the driveway. Betsy came running with her Boo Bag. "Grandpa!" Bests shrieked as she jumped into his arms. her grandfather swung her around and gave her a kiss. "Are you ready for some baseball, Betsy Boo?" he asked her, using her nickname. A grandfather takes his granddaughter to a professional baseball game, sharing the joys and excitements in every inning by keeping track of every strike, ball, hit and run. But what makes her experience even more special is the time she shares with her grandfather, learning all about his favorite team and players. "This heartwarming story about a family tradition and America's favorite pastime includes a full scorecard. With great illustrations, Betsy's Day at the Game teaches kids how to fill out a scorecard, and encourages them to share their memories with their families." 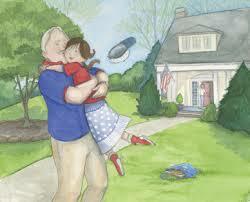 What a wonderfully written story that every grandparent should share with their grandchild. It took me back to the days when my grandfather sat in the stands watching me play fast pitch softball. He was my biggest fan. And in this story, Betsy and her grandfather are sharing something special and learning in the process. I had my three elementary aged children also read this book; and at the very end, all three were wiping tears from their eyes from the joy of sharing Betsy's Day at the Game. They also were eager to rip out the pages and start keeping track of their softball and baseball games, which made me realize that this book truly is a starter book and what would compliment it is by giving your child their own scorebook. The illustrations were soft and friendly. They truly complimented this heartwarming story. The authors ability to provide such great detail and warmth, making you feel like this family was your own. The detailed examples on teaching a child how to keep score provided a great intro for any child who was looking to learn how to keep score at any baseball game. The ending truly touched my heart, making me want to share in every special occasion with my own children just like Betsy did with her grandfather. The story teaches your child how to keep score throughout the story. There were times where my kids found it a little too detailed and wanted to skip to find out what happened at the end of the game. But that's a kid. I explained to them that this book was to share a story and to also teach them how to keep score. They wished they had a scorebook in front of them so they could follow as they read. I photocopied the pages, so they could. And smiles formed on their faces. My children also kept asking me what the teams name was. It was a little harder for them to bond with the team, because the author didn't create a fictitious team name. So created one ourselves. And again, they loved that they were able to share in the authors creation of the story. Overall, this book is a great gift for any child who plays baseball or softball, or is heading to a professional baseball game. I'm giving the book a 4.5 star rating based on my opinion above. This book is available on Amazon and other ebookstores. And I hope you will also read an interview I found about the author. Very well written and such a genuine person.